1. STAY CALM. The first thing to do when encountering disruptive behavior in the classroom is to stay calm. Count to ten, breathe deeply, and visualize a peaceful scene …anything to keep from losing a calm demeanor. No matter how much an offensive child tries to bait teachers, they lose credibility if they lower themselves to the student’s level. If the teacher keeps her composure, she will likely win the sympathy and support of the other children. They may even start using social pressure to discipline the disruptive student themselves. Keeping one’s composure, however, does not mean just accepting and tolerating the abuse. There are some specific, appropriate measures teachers can take in response to disruptive behaviors, which brings us to tip #2. 2. ARRIVING LATE AND/OR LEAVING EARLY. State the school’s policies clearly on the first day of class. Insist that children inform you, preferably in advance, of any special circumstances that will require them to be late to class – or absent altogether. Subtract points for coming to class late and leaving early. Draw attention to disruptive students by pausing as they walk in and out. Alternatively, set aside an area near the door for latecomers and early leavers. Finally, to discourage packing up early, routinely conduct important class activities for the beginning and the end of class. 3. ASKING FOR EXTENSIONS AND MISSING ASSIGNMENT DEADLINES. Specify penalties for late work, with or without an "approved" extension (e.g., docking a portion of the grade). Some teachers feel comfortable strictly enforcing this policy. But if you prefer to be flexible, you probably realize that children occasionally have good reasons for not meeting deadlines. But they also occasionally lie. So, assess each extension request and excuse on a case-by-case, child-by-child basis, perhaps allowing a single, documented incident – but drawing the line at the second. 4. PACKING UP EARLY. Routinely reserve some important points or classroom activities (e.g., quizzes, writing exercises, clarification of the upcoming readings, study guide distribution, etc.) until the end of class. Alternatively, have children turn in assignments at the end of class. 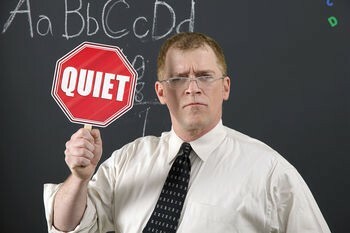 Paper-rustling and other disruptive noise-making during class can be stopped the same way as is talking in class. 5. SHOWING DISRESPECT. Make your expectations for appropriate classroom manners clear from the start and reinforce them continually by your being a good role model. Enlist the aid of other children to monitor and report disruptive incidents. Talk to disruptive students privately and explain that their behavior is affecting their peers’ ability to learn. Sometimes children show disrespect to get the attention they believe they can’t get through any other means, to vent their anger towards authority in general, or to express some other deep-seated emotional problem. Leave such cases to the school counselor and refer such children as needed. 6. TAKING IN CLASS. Occasional comments or questions from one child to another are to be expected. However, chronic talkers bother other children and interfere with your train of thought. To stop them, try a long, dramatic pause. Then, if necessary, accompany your pause with an equally dramatic stare at the disruptive students. Say something like, "I really think you should pay attention to this; it will be on the test" or "You are disturbing your peers." If the problem continues, get assertive with the disruptive students outside the class. Direct intervention and public embarrassment are strictly last resorts. 7. WASTING TIME. If children habitually try to monopolize class time, encourage them to speak with you after class to clarify their questions. You can broaden the discussion and call attention away from the disruptive child by asking the rest of the class for the answers. Alternatively, you can put out a question box. Read the questions after class and briefly address some of them. 8. 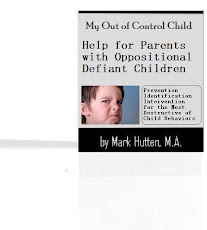 Become well-educated in all aspects of Oppositional Defiant Disorder. 9. Be sure to take care of your own physical and mental health. 10. Your best strategy against all forms of disruptive behavior is prevention. Be aware of potential problems, and plan carefully to keep them from developing.